I still love my Acure Cocoa Butter + CoQ10 lotion, but in classic beauty blogger logic, with my tube coming to an end, I decided it was time to branch out and try something new. I've been bouncing back and forth between body oils and lotion recently, as thicker creams can be more than I want to deal with in the hotter months, so it was perfect timing when I stumbled across (Seed)'s lighter-textured body lotion. 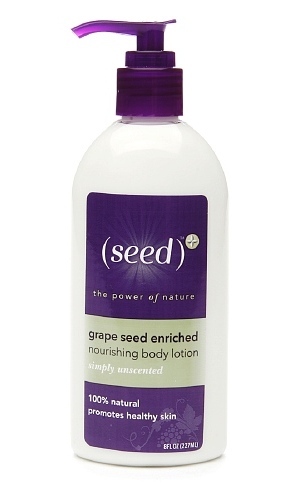 (Seed)'s affordable bodycare products are enriched with grape seed oil, which is both an excellent source of antioxidants and high in essential fatty acids and Vitamin E. The company is also committed to making a positive environmental impact with minimal, recyclable and biodegradable packaging and sustainable business practices. (Seed)'s body lotion is truly a perfect summer lotion. It's light and silky and it sinks in almost immediately. The pump top is also super convenient for lotioning in a hurry, and considering it's a runnier lotion, it's also perfect for controlling the amount of product dispensed. The lighter texture does mean that sometimes I need to reach for something extra for those drier spots like elbows and feet, but in general, (Seed)'s lotion does an excellent job keeping my skin soft and hydrated. The lotion does also have a moderately strong "unscented scent," by which I mean you can definitely smell the natural oils and other ingredients, but the smell doesn't linger once the lotion is absorbed. If you prefer a scented product, (Seed) also makes citrus and lavender varieties. My only complaint, and the reason that I am hesitating over repurchasing this product, is that it contains non-organic soybean oil. I haven't seen much research on the effects of soy in topical cosmetics, but it's something I try not to eat a lot of - particularly non-organic soy due to GMO concerns - so I'm not sure it's something I want to be slathering all over my body on a regular basis. That said, the (Seed) website shows a new label and the ingredients don't list soybean oil, so it's possible they've reformulated since I purchased my bottle and this is now a moot point. I'll update this once I find out for sure! Ingredients: Water (aqua), aloe barbadensis leaf juice, vitis vinifera (grape) seed oil, emulsifying wax NF, helianthus annuus (sunflower) seed oil, glycine soja (soy) oil, caprylic/capric triglyceride, butyrospermum parkii (shea butter), stearic acid, glycerin, camellia sinensis leaf extract, cetyl alcohol, gluconolactone (and) sodium benzoate, tocopherol, tapioca starch, rosmarinus officinalis (rosemary) leaf extract. Disclosure: Post contains affiliate link to Vitacost. Signing up through my link will save you $10 off a purchase of $30 or more.